2018 was a banner year for high-growth software companies going public. There were almost 20 in total and 16 high-growth software names, of which 14 made it to the public markets (Qualtrics and Adaptive Insights were acquired before trading). While I’ve done S-1 write-ups on almost all of these, I thought it would be interesting to benchmark various stats and KPIs from each company. While there are hundreds of total variables, I outputted some relevant stats in the following sections and summarized below. Firstly, how long did it take? The below chart has years from founding to IPO year. The median is 14 years. Note the scale of these companies varies widely (more in next section). All of these companies have meaningful scale and the median LTM revenue is $192M. Dropbox is a huge outlier at ~$1.1B of LTM revenue. Even at scale, these companies are growing quickly. The median growth rate is almost 40% year-over-year for this group. 4 out of the 16 companies were growing over 50% YoY. While all these companies have subscription models, only a couple have 100% of their revenue subscription or recurring in nature. 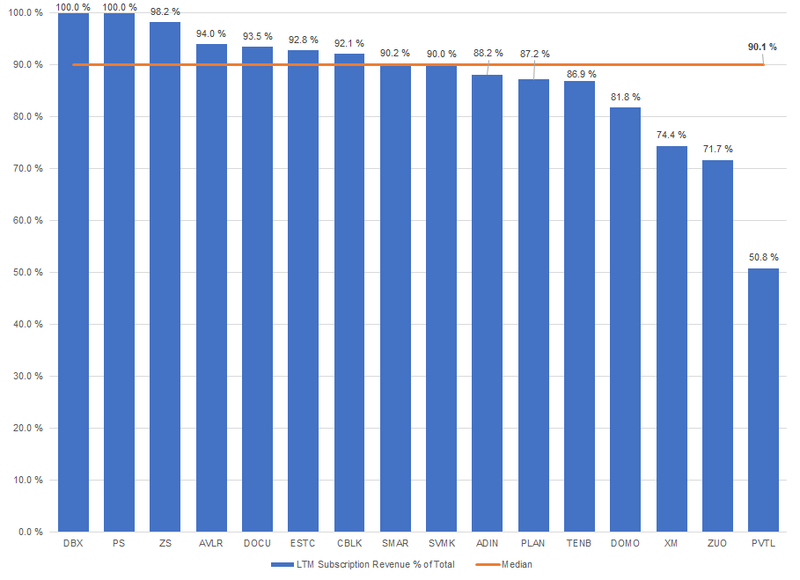 The below benchmarks LTM subscription or recurring revenue as a percent of total revenue. The median is 90%. The other 10% is mostly comprised of professional services. While none of these companies report ARR (annual recurring revenue), it can be derived by multiplying quarterly subscription revenue * 4. 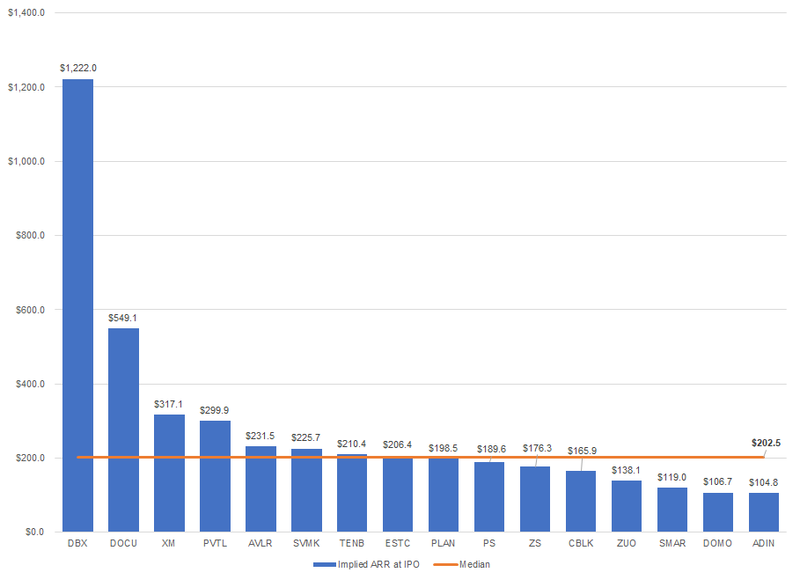 Again, Dropbox is a huge outlier but every company is over $100M of implied ARR with the median at $203M. 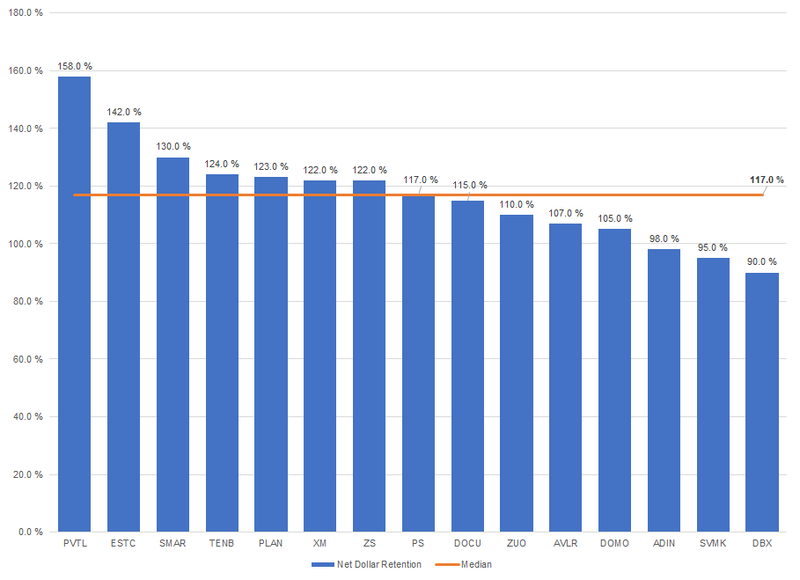 The median YoY % growth rate for ARR is ~39% and the below benchmarks how much net new ARR each company added (difference in subscription revenue * 4) at IPO quarter. The median net add is ~$18M. 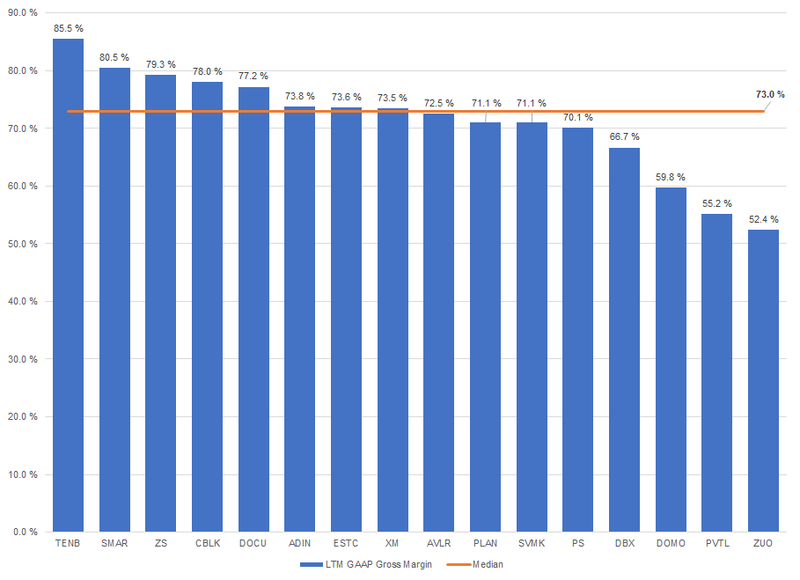 Now looking at the P&L and specifically gross margin, the median for this group is 73%. 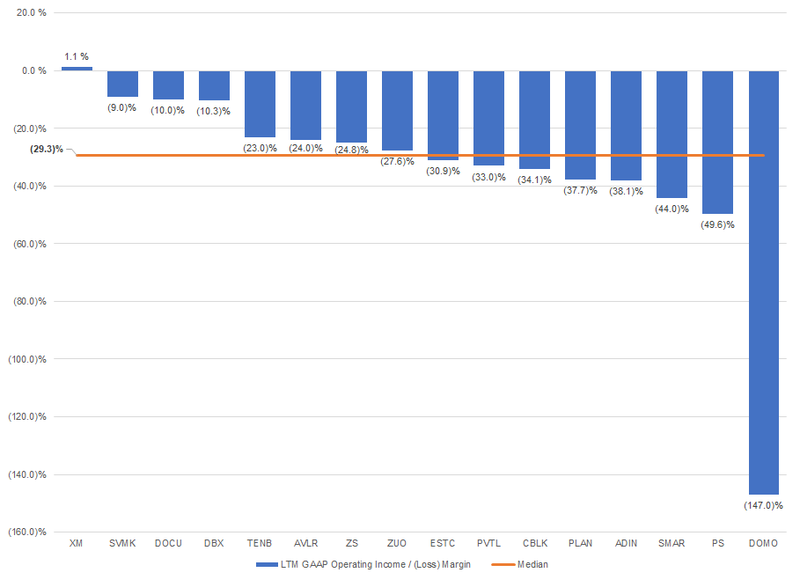 Almost every company is losing money on an operating-basis (except Qualtrics) and the median LTM GAAP operating margin is ~(29)%. 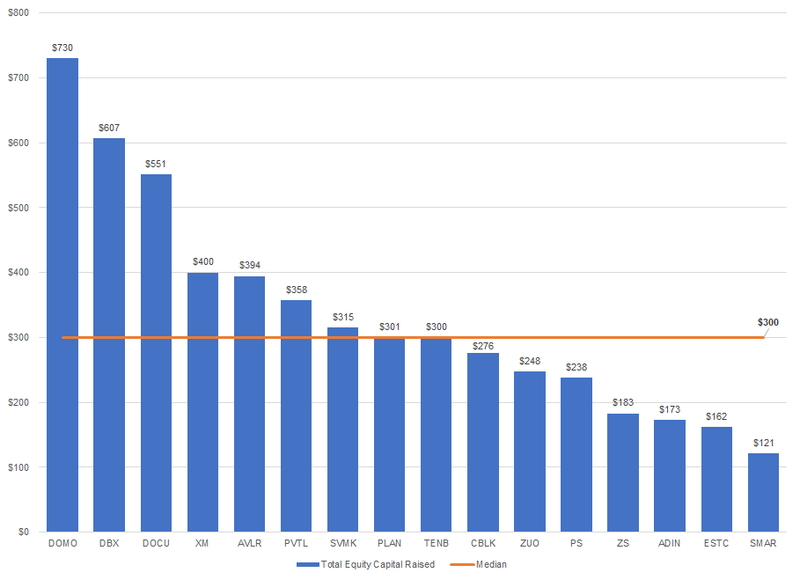 Domo was significantly in the red (more on their cash burn below). 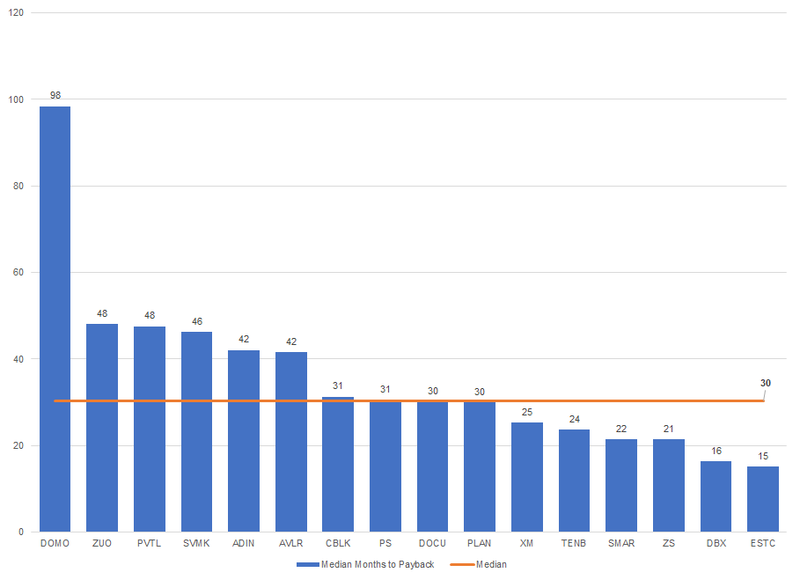 Expansion is a critical metric for any SaaS company and while some of these businesses have slightly different definitions, they’re benchmarked below. The median is 117%. For a full list, see this link. Companies typically don’t report detailed customer segment information so it’s hard to know exactly how much all their customers are paying, but we do have averages. The below benchmarks annualized subscription revenue over total customers at IPO quarter. The median is $32.5K. 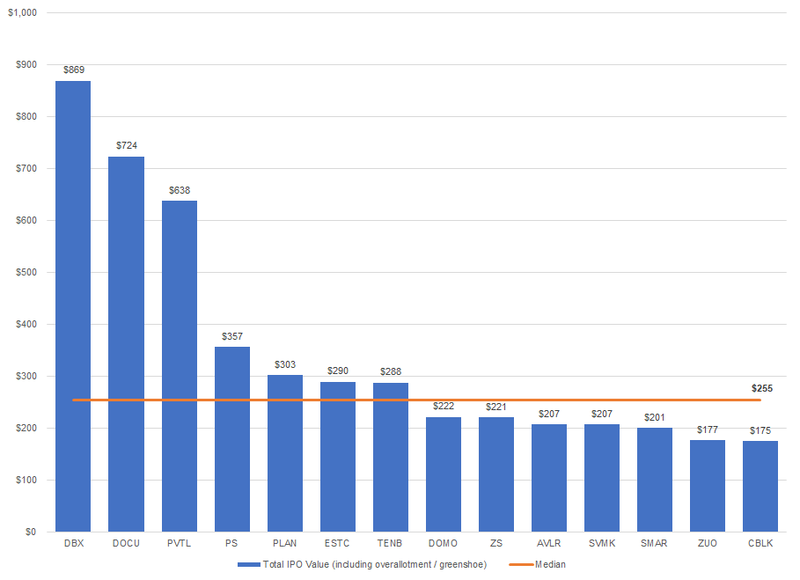 Dropbox, by far the largest company in this group, has the smallest ACVs of $111. The scale of revenue varies widely in this group and so does the employee base. 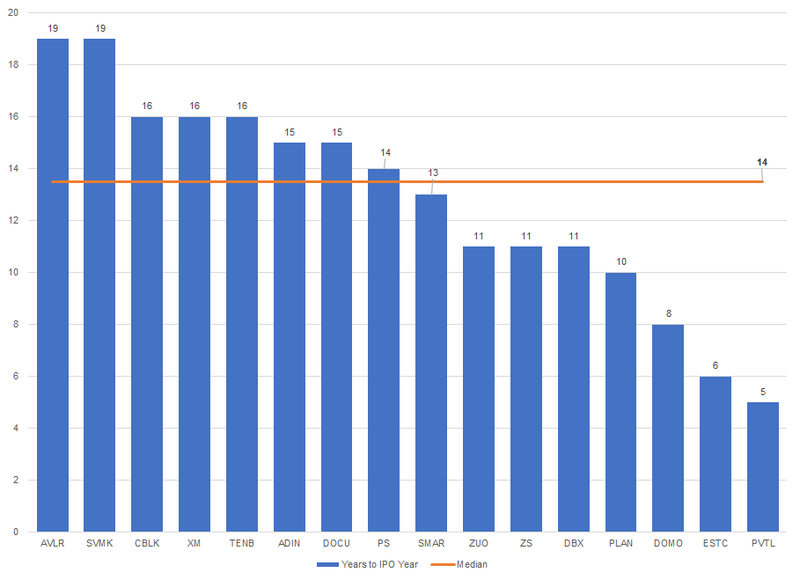 The below benchmarks total employees at IPO quarter. The median is almost 1,000. 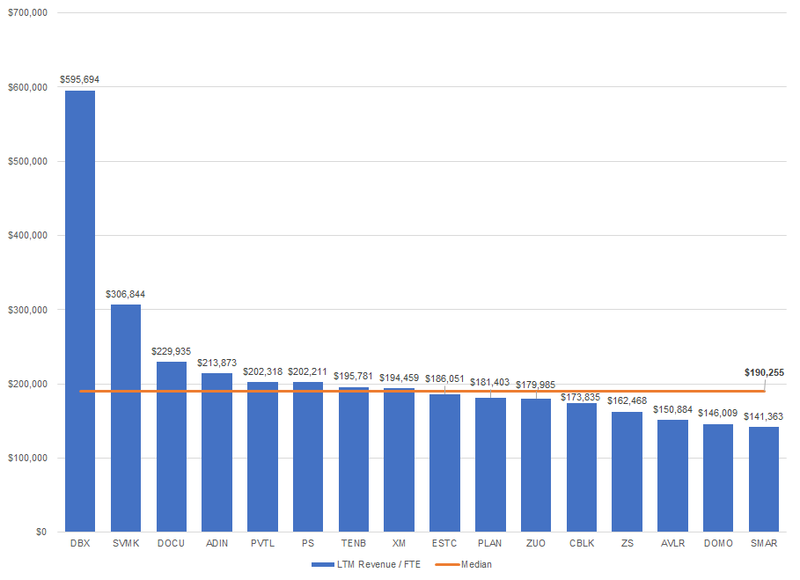 While the amount of employees is interesting to look at, the revenue per FTE might be more important. Each company has a different product, market, delivery model, price, end-customer, etc., but it’s not a surprise that Dropbox, which has a consumer-like and self-serve go-to-market, generates the most revenue on a per employee basis. The median is ~$190K per FTE. 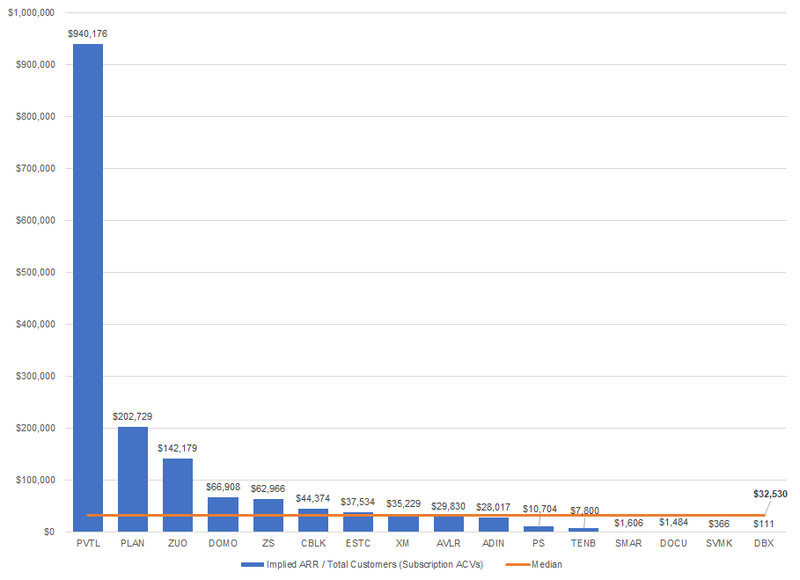 It’s hard to benchmark precise customer acquisition costs since most companies don’t report new customer adds, but it’s possible to standardize and find the months to payback using a CAC ratio (implied net new ARR * gross margin / sales and marketing spend of prior quarter). It’s no surprise Elastic and Dropbox, both with self-serve go-to-markets, are the most efficient. 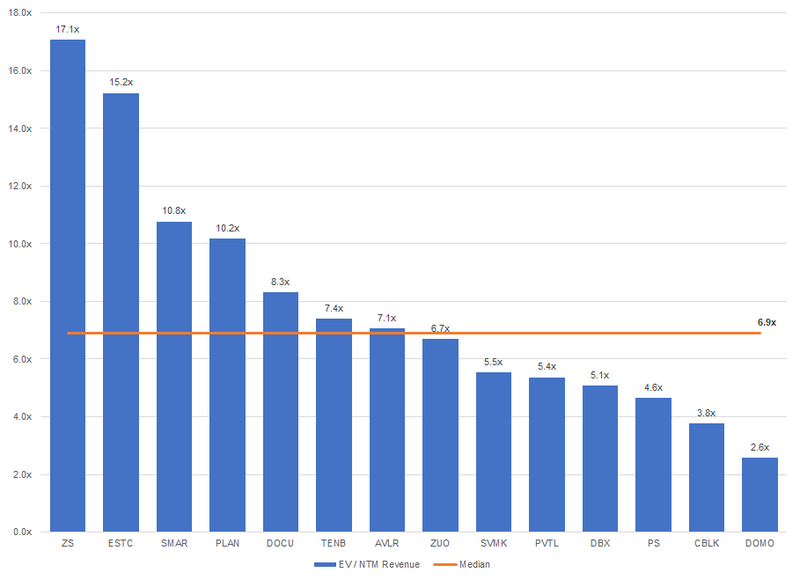 Elastic is also the fastest growing company in this group with almost 80% YoY revenue growth. The median months to payback is ~30. All of these businesses were venture-backed. The below benchmarks include total equity capital raised in the private markets. The median is $300M. 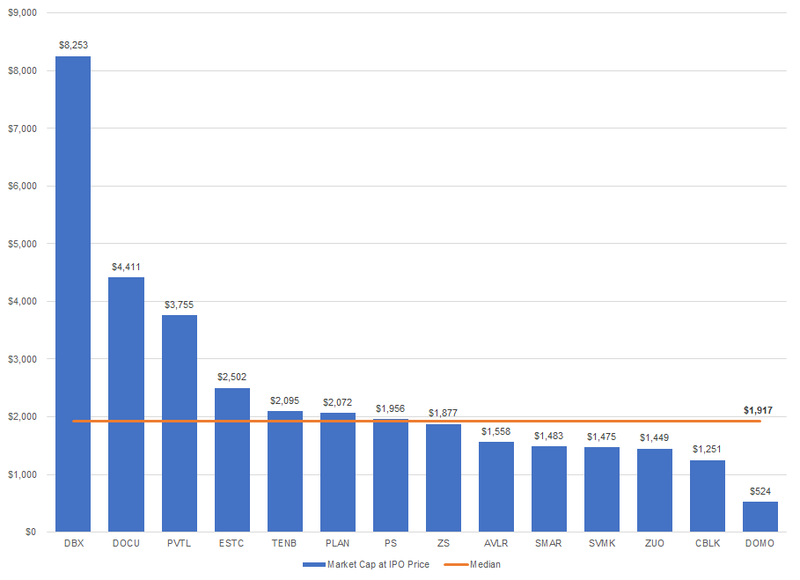 Scaling a software company is expensive, and each of these companies burned through significant amounts of money to reach IPO scale. 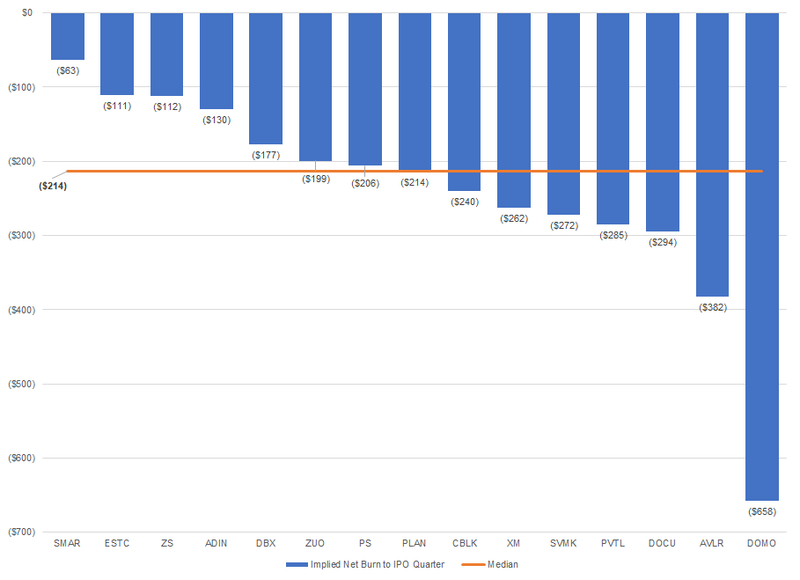 The below benchmarks implied burn — cash on the balance sheet at IPO quarter minus total equity capital raised. Some of the venture capital dollars were likely secondary, which is not reported, but the below should be close. The median burn for this group to was ~$215M. More cash lifecycle data here. 14 out of these 16 companies made it to trading and the median market cap at pricing was almost $2B. Moreover, Qualtrics was acquired for $8B and Adaptive Insights was acquired for $1.6B days before their respective offerings. Each company also raised significant dollars from the public markets to add to their balance sheets. The median offering size was $255M. 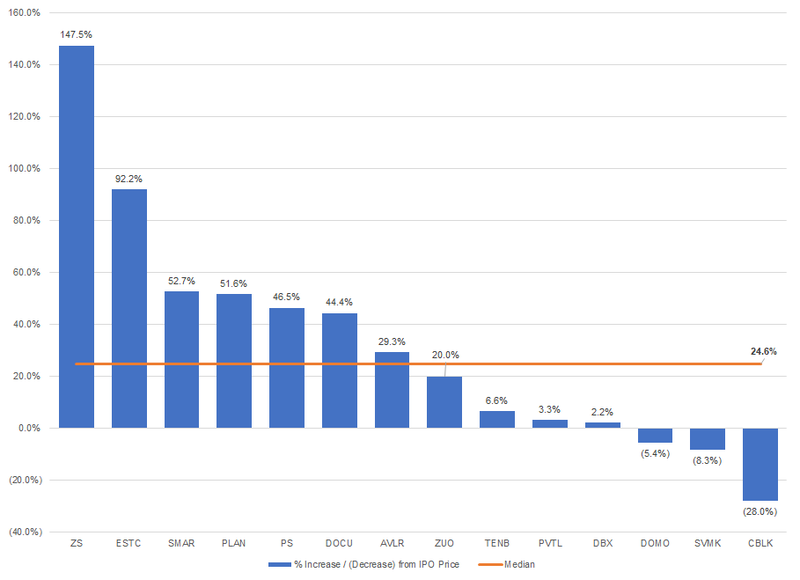 Each company started trading in 2018, and while many are still in the lock-up period, it’s interesting to look at performance to date. The fastest-growing companies are being rewarded the most in the public markets thus far. 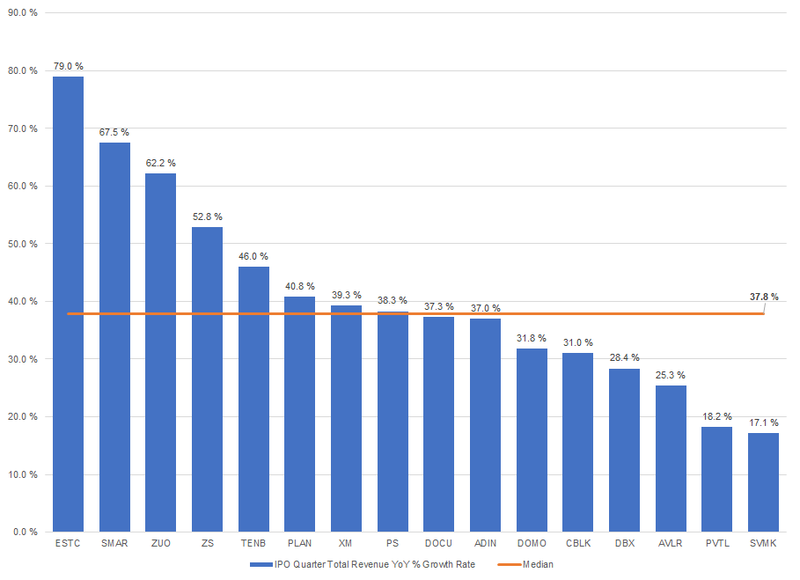 In most cases, high-growth software companies are valued on a multiple of forward revenue. 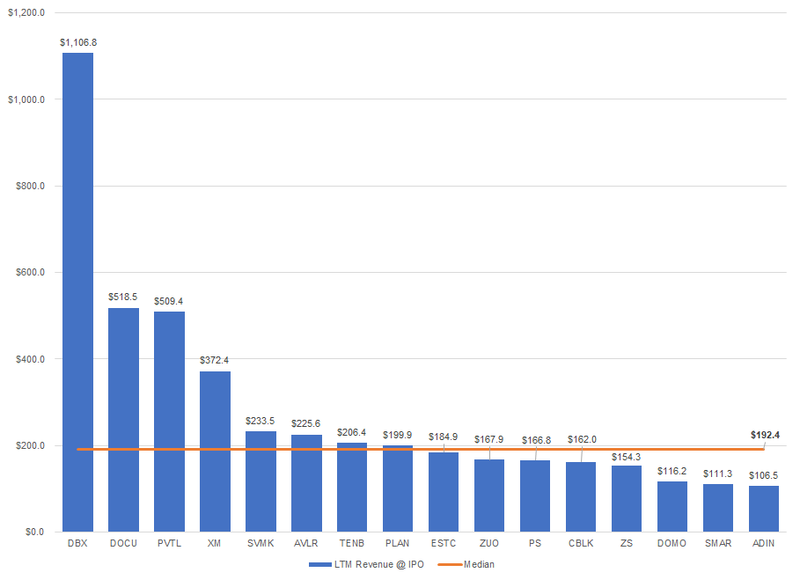 The below benchmarks enterprise value over NTM (next-twelve-months) revenue. The median is ~7x. 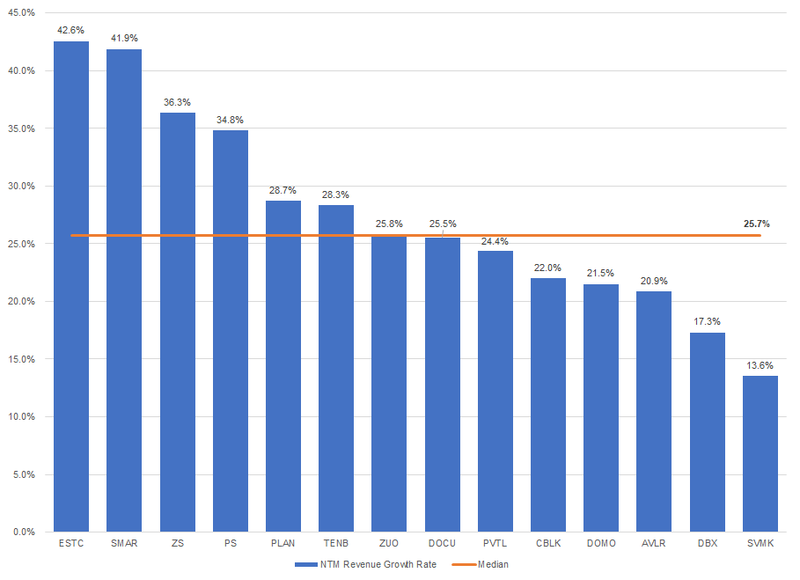 These businesses are growing revenue quickly and their valuation multiple is obviously highly correlated with growth. The below benchmarks NTM (next-twelve-month) growth rates — the median is ~26%. 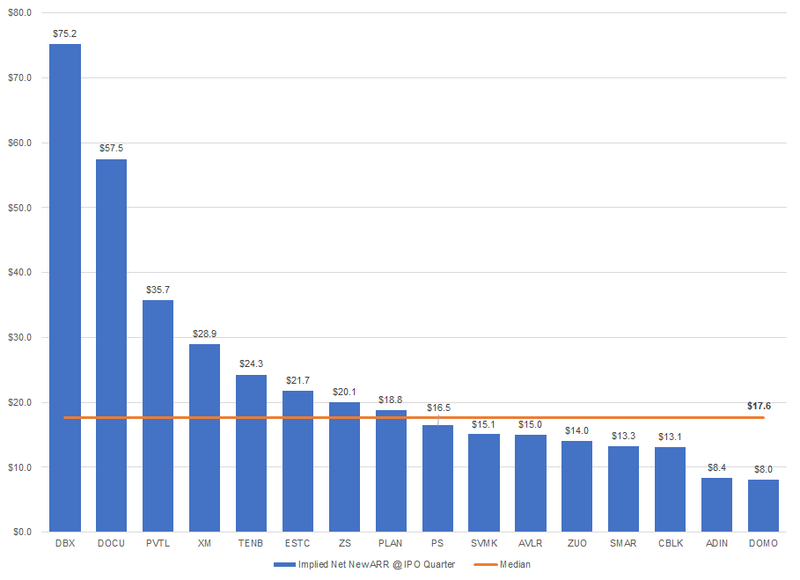 What did it take to IPO as a SaaS company in 2018? To make it public as a SaaS company in 2018, you have been around almost 15 years, are ~$200M+ in ARR and growing ~40%, have ~75% GAAP gross margins, are losing money, have a 120% net dollar expansion rate, sell a ~$30K product, have almost 1,000 employees, have raised $300M from investors (and burned through at least $200M of it), and sold over $250M of stock in an IPO at a valuation of ~$2B! And in a short period of time, you’re up 25%+ from IPO price. Of the 14 high-growth SaaS companies that traded this year, they raised a cumulative $4.9B in the public markets, a staggering number. 2018 saw almost double the amount of SaaS IPOs than 2017, and there are dozens of SaaS unicorns in the private markets. 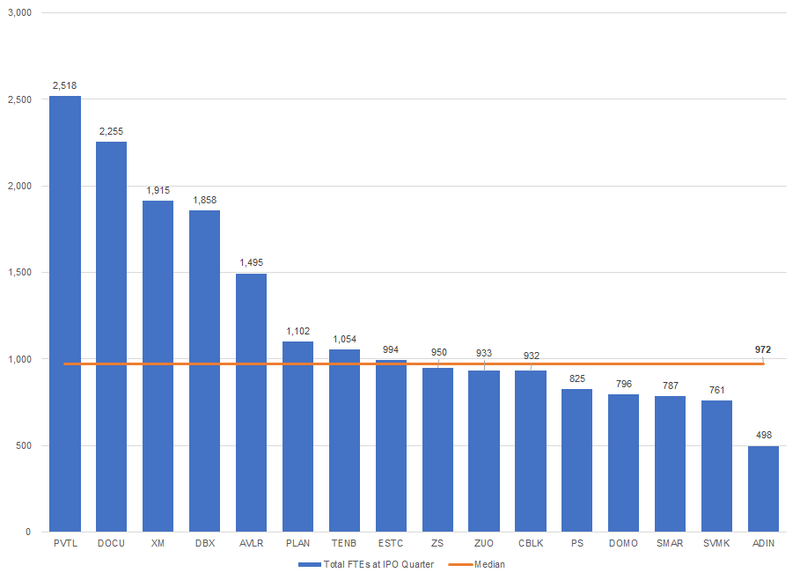 It’s clear public market investors are eager to invest in high-growth software assets and I have no doubt the flurry of S-1 filings will continue in 2019. Adaptive Insights, Anaplan, Avalara, DocuSign, Domo, Dropbox, Elastic, Pivotal, Pluralsight, Qualtrics, Smartsheet, SurveyMonkey, Tenable, Zscaler, Zuora.